421 Guest House: the ideal low budget option for Habla Ya students only a block from the school, with superb customer service and friendly owners onsite. Saigon Bay Bed & Breakfast: 3 room over the sea hotel in Saigon Bay with comfortable social area and full kitchen. 421 Guesthouse is by far the ideal low budget option for Habla Ya students, situated at only one block or 2 minute walking distance from the school in a quiet residential area. 421 has been set up in a traditional Caribbean mansion, entirely made of wood, giving it the unique homey feel. Its spacious rooms and common areas with balcony in the front and in the back, will make you feel like you're in a huge vacation villa instead of a hostel. 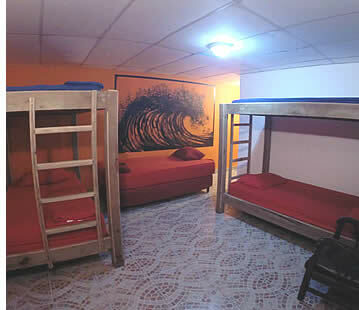 Guesthouse 421 is definitely more like an "upscale" budget option which offers all the amenities of your average Bocas hostel, including wifi, but with nicer facilities and AC (which is rare in Bocas del Toro for low budget options). 421 has dorm rooms, shared private rooms and private suites. All rooms are comfy and clean. The dorm or group rooms have 5 beds in each, two bunk beds and one single bed as well as one bathroom. The shared private rooms have 2 single beds in each of them and are connected with one other private room through the shared bathroom. This option is ideal for friends traveling together who don’t wish to share a bed, and want some privacy as opposed to sharing a room with other travelers. The private rooms with shared bath have double beds in them, and share the bathroom with one other private room. This option is ideal for couples who want to have some privacy, yet don’t want to break the bank. This is the cheapest option you’ll find for a private room because the bathroom doesn’t have hot water. However, that’s really no big deal here in Bocas, as “cold” is more like lukewarm, since temperatures are high all year round. The suites are entirely private with their own private bathroom, and you’ll be able to enjoy a comfortable king size bed. As you'll be studying with us for several weeks, you also have the option to cook your own meals in the communal kitchen. The communal kitchen is ideal if you want to cook your own meals without having to eat out all the time. 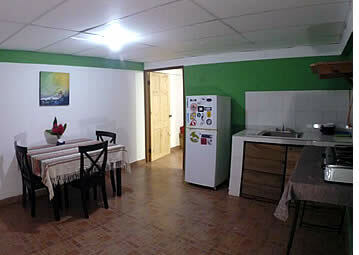 The shared kitchen has a stove, a refrigerator and dining area. All the rooms are equipped with AC and wifi for you to stay connected. The large communal area with a sofa and cable TV as well as some books will allow you to just relax, enjoy a nice cup of coffee or a cold beer and chat with fellow students or travelers. The owners, Luis Alberto and Juan Fe, are best buddies and experienced surfers, so they will be able to point you in the right direction if you are looking for some good surf breaks (or ask us!). They also live on-site so without any doubt, you'll always be looked after. 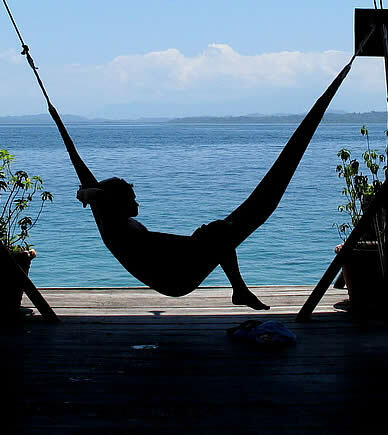 SIGN UP & BOOK A ROOM AT 421 GUEST HOUSE..
Just a 2 minute walk from Habla Ya Spanish School in Bocas del Toro, 421 Guest House is literally just 1.5 blocks away from Habla Ya Bocas del Toro. The physical address is Avenida Norte between 8th and 7th Street. If you arrive by boat with Bocas Marine Tours you'll be dropped off right on main street (3rd Street): just take a right (up north) walking up the main street for 6 blocks (you'll pass the park), until you reach the end of that road and you'll have reached Avenida Norte (North Avenue). Take a left hand walk five and half blocks and you'll find 421 Guest House to your left. If you arrive on 1st street with any other of the boat companies, just walk through the park until you reach 3rd Street and from there continue north and follow the instructions as just described above. If you arrive by plane walk down the street leading away from the airport and make a left turn on the first crossing. You'll be walking north up 6th Street. Walk for 3 blocks and take a left, and walk another block and a half. You'll find 421 Guest House in the middle of the block to your left. From any of the boat stations or the airport you can always catch a taxi to your destination. 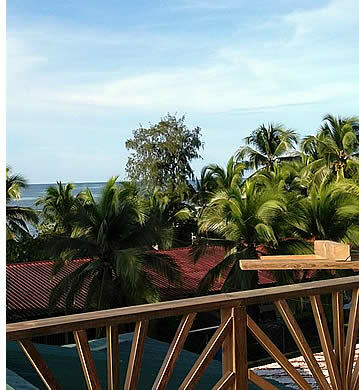 Saigon Bay Bed & Breakfast is a 3 room over the Caribbean Sea hotel located in the local neighbourhood contiguous to our Spanish School's, home to authentic Caribbean living and the very best sunsets of Bocas Town. 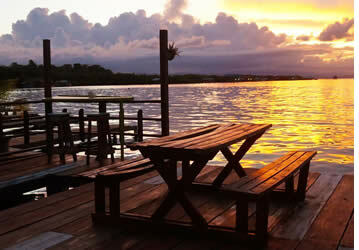 Here you'll be able to experience Bocas as locals do. 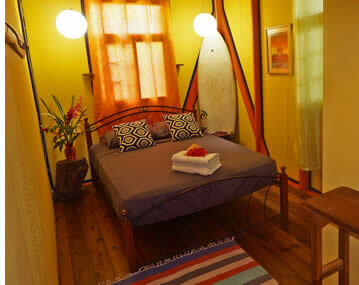 An over the water home immersed in Saigon Bay, painted and decorated with colourful Caribbean flair, this bed and breakfast offers a comfortable social area and a large deck to relax and take it all in. You'll be able to make use of their kitchen and fridge, and benefit from free potable rain water too. As an Habla Ya guest you'll also receive free bike usage and daily breakfast over the Caribbean. All rooms have en-suite bathrooms with hot water showers, screened windows and fans. Being on the bay with lots of windows allowing the breeze to flow through makes for an enjoyable and truly authentic visit. Room #1 is boat room. It has a loft style full-size bed accessible by a ladder. This room has air conditioning and desk with chair. Room #2 is the surfer room with queen sized bed, and bathroom separated by wooden French doors and en-suite large hot water rain shower. Room #3 has a queen sized bed, and a single bed above. This room has a futon and is the most spacious in our bed and breakfast. Angie was born in the Panama Canal zone and grew up in Panama. Nicolas was born in Caracas, Venezuela. Both have been living in Bocas del Toro for nearly 15 years. They love the outdoors, training and are pretty mellow. Angie works from home and Chapo is a surf instructor and tour guide. Their three dogs live with them in their upstairs apartment as well as their cat but sometimes also chill on the deck. Your superhosts 'Chapo' and Angie are on site offering full service concierge for whatever you desire. The greatest spots to see, visit, activities, island trips, surfing, diving, four wheeling, zip lining, horseback riding, shuttle trips, advice on how you can get there, or we can put you with the right people to take you. SIGN UP & BOOK A ROOM AT SAIGON BED AND BREAKFAST.. 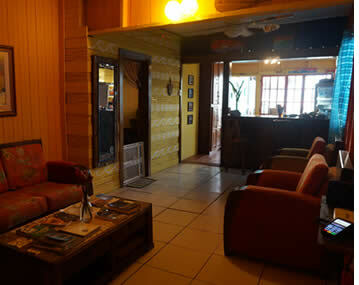 Looking for a Nice & Clean Budget Hostel? Different options, different styles... Contact us!